The third edition of SAA Track and Field Series for the year 2012 will be held this weekend on the 3rd to 4th March. This time round the venue will be held at Bishan stadium after the first two series took place at Bukit Gombak Stadium. The event saw an increase in participation level as the numbers jumped from 1400 to 1600 plus participants compared to the last series. The bulk of these athletes are preparing themselves for the upcoming National Inter-School Championship which will commence at the end of this month. Highlighting some of the events for Series 3, there’s a possibility that there will be new national mark in the pole vault event. 16-year-old Chan Sheng Yao from Hwa Chong Institution will not only be gunning for the boys Youth pole vault record which stands at 4.63 metres, but it is also believe he will attempt to break the National mark of 4.81 metres. 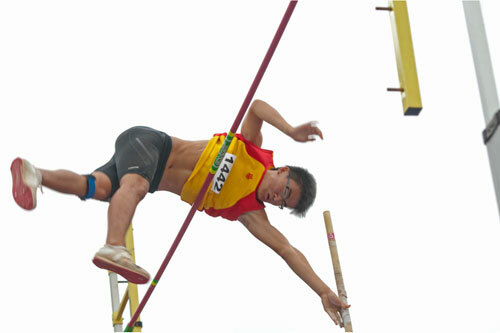 Chan Sheng Yao is the current record holder for the boys Youth pole vault event. Carmel Teo under the watchful eye of Coach David Yeo has developed a talent for the future. Another pole vaulter to watch out for would be Carmel Teo. 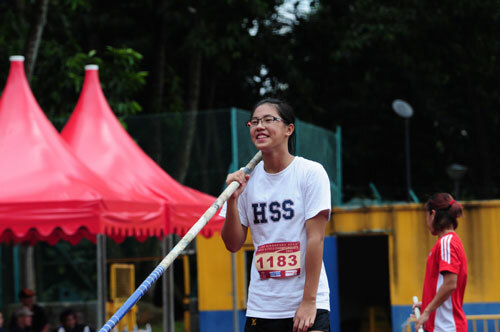 The Henderson Secondary student athlete soared to a new girls Youth record at the last Series with a height of 3.21 metres. The 16-year-old would be hoping to emulate her good form and bag another record at Bishan this weekend. For the men’s 400 metres, it will be a mouth watering affair as we’ll be seeing two of the Republic brightest prospect in the quarter-mile event, Ng Chin Hui of Raffles Institution and Seow Yeong Yang from Wings Athletic Club, slugging it out on the track. 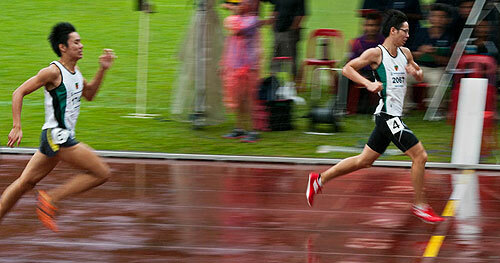 18-year-old Ng Chin Hui proved himself the better athlete last year as he earned the title as the fastest schoolboy in 2011 with a superb effort of 47.97 seconds which earned him as the fifth fastest Singaporean to run the distance. Ng Chin Hui conceding defeat to Seow Yeong Yang in their last 400m showdown. While this year, 19-year-old Seow Yeong Yang proved himself to be the only Singapore athlete who has run below 50-seconds in the 400m event. In a showdown in the last Series 2, Yeong Yang led from start to finish. He ended the race in 49.70 seconds to Chin Hui’s 50.07 seconds. The hotly contested 400 metres event would also be accompanied by national sprinters who are doing their pre-season race. SEA Games 4x100m relay silver medalist Md. Elfi Mustapa, Lee Cheng Wei and Md. Amirudin Jamal would start from Lane 3, 7 and 8 respectively. Dark horses for the race are Donovan Chan from HCI and Mohd, Shamimi Azmi from Negeri Sembilan. This Series will also see the debut of the hammer throw event. Athletes will be competing in the women U20/Open (4kg), Girls U18 (3kg), Boys U15 (4kg), and the Boys U18 (5kg) in the hopes to qualify for the upcoming SEA Youth Championship, 27-29th April. Other athletes to watch out for are the duel between Abdul Hakeem and Ang Chen Xiang in 110m hurdles Open height (Both are from Wings Athletic Club), Akid Chong from NYP in the men javelin throw (800g), Nurul Jannah (Swift) and Xu Wei Xin (Club Zoom) in women long jump, Timothee Yap from HCI in the men flat and hurdles 400m, Zachary Devaraj from ACSI in the men 1500m U20/Open, NTU’s Muhammad Shah Feroz in the men 3000m steeplechase, Peter Back from MR25 in the men 10,000 walk, Swift’s R. Ranjitha in the women 800m U20/Open, Muhammad Reyhan running the boys 1000m U18, Hannah Lee from NYP in the women discus throw U20/Open, Eugenia Tan of Singapore Sports School in the women 100m U20/Open, and Wings Athletic Club’s Rachel Yang in the women pole vault.